On Veteran's Day at the IceBox on Tuesday, the Lincoln Stars will be looking to snap their three-game losing streak with a tilt against the visiting Des Moines Buccaneers. If you can't make it to the game, you can follow the boxscore online via Pointstreak, listen to Stars radio announcer Mike Melbye on 93.7 FM "The Ticket," or watch the game live on FASTHockey for a fee. With a record of 3-6-1 (7 points) the Lincoln Stars are in last place in the USHL western conference, three points behind the seventh place Omaha Lancers. Click here to view the current league standings. Lincoln's opponent Tuesday evening, the Des Moines Buccaneers, are a familiar one for the Stars. This past Saturday night in Des Moines, the Bucs beat the Stars by a score of 5-3. Coming into Veteran's Day game, the Buccaneers have a record of 9-3-1 (19 points) and are in a two-way tie for first place in the USHL western conference with the Sioux City Musketeers. The Stars will be honoring veterans with tickets specials Tuesday night along with a silent auction for the military themed jerseys the team will be wearing during the game. Click here to read more about that. 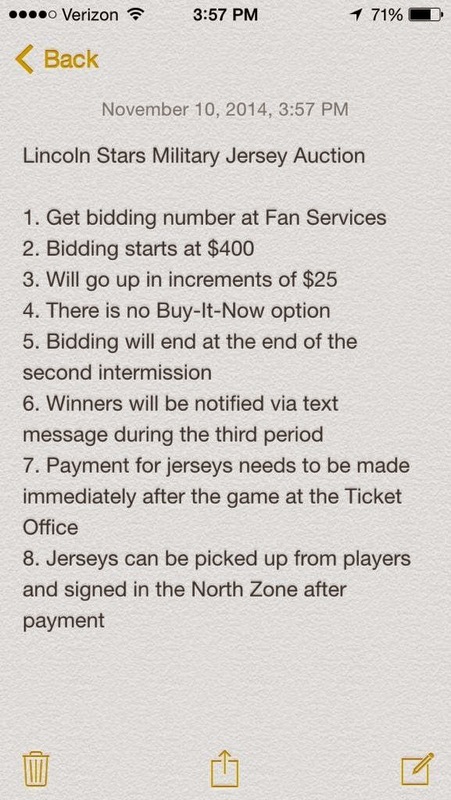 To the left you'll see more particulars of the silent jersey auction, which the Stars tweeted earlier today. If it's hard to read the text on the image you can click on it to enlarge it. A $400 starting point is a little too rich for my blood, but it's going to a good cause. As someone who grew up in a military household, I'm happy to see the Stars do this for veterans. I've seen other USHL/college/NHL teams do this, and I've always wondered why the Stars didn't do the same especially considering how rabid our fans base is. Seemed like a slam dunk to put a Stars logo on a digitized camouflage jersey and sell them after the game to benefit a veterans group. I'm hoping this will now be an annual thing for the Stars. Hopefully we'll see a good crowd for this game and a 60 minute effort from the Stars on the ice. I'm sure there are a lot of Stars fans eager to get their live hockey fix after the postponement of the Friday night game last week. Let's pack the IceBox and help the Stars get back into the winning column. I hope they make the Veteran uniforms an annual thing as well. Not only does it go to a great cause, but I can't afford one this year! I'm pretty excited to see how the stars play. A three game losing streak is more than enough for them to put a 60 minute effort together and pick up the W tonight.